[Deam views this specis as having two varieties: var. arvensis with glabrous pedicels and short calyx lobes (less than 1 mm long) and var. sativa with retrorsely pubescent pedicels and calyx lobes usually more than 1 mm long]. This species is found throughout the state although it is more frequent in the northern part. It is very variable and I am regarding it as a species complex. 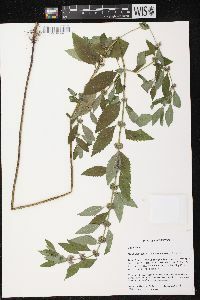 I am referring to it all of my specimens which I had formerly named Mentha arvensis, Mentha arvensis var. 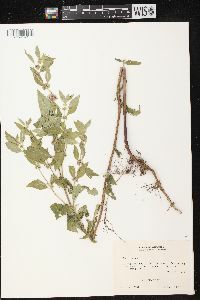 canadensis, and Mentha arvensis var. glabrata. I have only 72 sheets from which to make a study and I find that this number of specimens together with the meager amount of literature available are not sufficient to justify a satisfactory conclusion. I find that Victorin in his "Flore Laurentienne" treats the plants of his area as one species and calls them Mentha canadensis. The plants, as a whole, differ widely from each other, and large and widely spreading plants differ greatly in the parts of the same plant. Bentham, in his monograph of Labiatae, described seven varieties, one of which I am recognizing because it has one character which seems to be constant. Doubtless the plants of America are different from those of Europe and Asia and it may have been wiser to have followed other authors in calling our plant Mentha arvensis var. 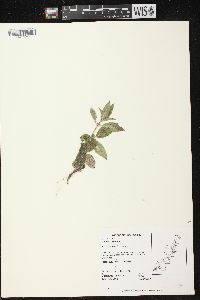 canadensis or Mentha canadensis as Victorin did. Without convincing proof I prefer to be conservative and use the old name and await the report of a monographic study of the genus. All Indiana forms are shown on one map. I have only two sheets of variety [sativa]. One is from Decatur County and one is from Whitley County. 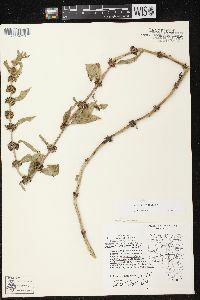 The upper parts of the stems and branches of these specimens are pubescent all over; the leaves are of an ovate type, strongly rounded or subcordate at the base; the calyx lobes are very sharp and 1-2 mm long; and the corollas pubescent without. In addition to M. canadensis, Deam recognized M. gentilis which is now generally viewed as conspecific with M. canadensis. 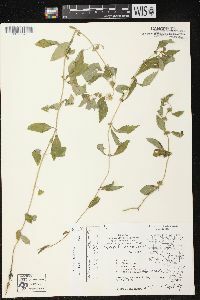 This species [is characterized by more or less glabrous stems and calyces and short corolla (about 2 mm compared to 4-5 mm in C. canadensis). Mentha gentiles] has been reported from four counties and since it is a frequent escape in other states, it is given a place in our flora. It has been reported from Clark, Jefferson, and White Counties. I have it from Decatur County. Stems ascending or erect, 2-8 dm, pubescent with few to numerous, short and retrorse to longer and more spreading hairs, often glabrous between the angles; lvs short- petiolate, the blade 2-8 cm נ6-40 mm, glabrous or hairy, serrate, acuminate, with several pairs of lateral veins, rather narrowly ovate to more often somewhat rhombic-elliptic, those of the infl, at least, tending to be cuneately tapered to the petiole; verticils compact, axillary to the scarcely reduced (middle and) upper lvs, and separated by internodes of fairly ordinary length; cal pubescent, 2.5-3 mm; cor white to light purple or pink, 4-7 mm, rarely casually 5-lobed; 2n=24-96. Moist places, especially along streams and shores; circumboreal, in Amer. s. to N.C., Mo., and Calif. Native Amer. 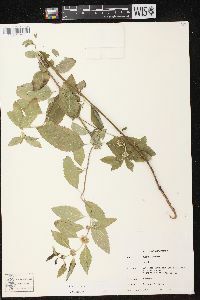 and e. Asian plants, as here described, are var. 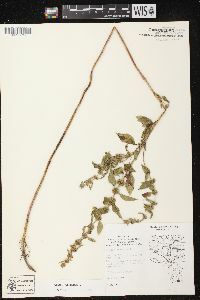 canadensis (L.) Kuntze (var. 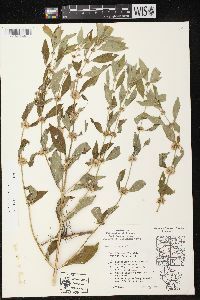 glabrata; var. villosa). The European var. 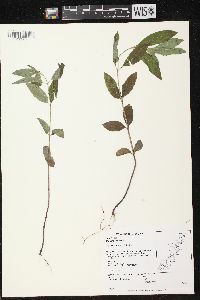 arvensis, with the lvs of the infl relatively broader, more ovate, and somewhat broadly rounded to the petiole, is intr. from Nf. to Que. and Pa., but extremes of one var. could pass for the other.